It seems to me that there is a whole world out there of ladies with blogs and pinterest boards about home improvement/decoration/foodie stuff. My wife follows a lot of these DIY decorating type blogs and stuff. She is also a fan of a few internet-famous cooks. Like the Prairie Woman as I call her (it’s really the Pioneer Woman, but I can never remember that). Apparently this home-cooking, self-decorating industry is a huge money-maker. My mom and Jen love to watch those shows where people get their houses redecorated, or where some chef springs upon someone at a grocery store and forces his way to cooking their dinner. 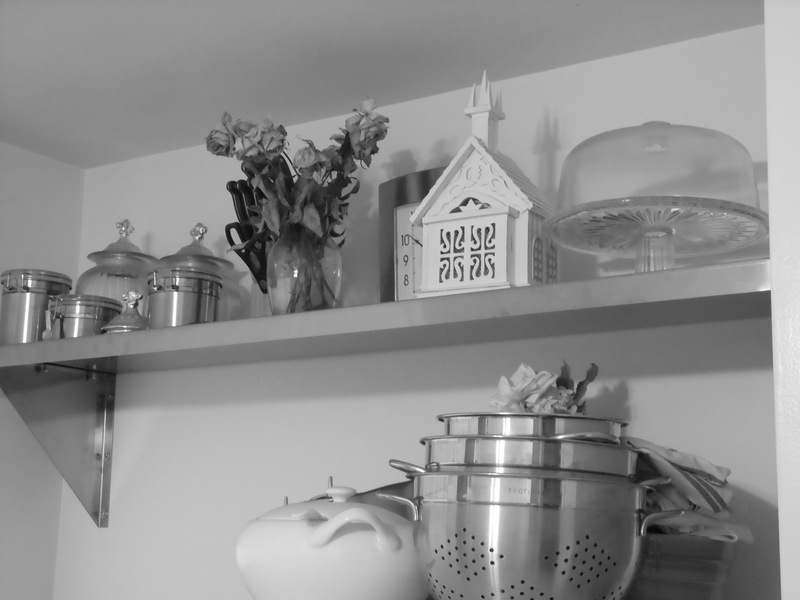 In honor of all that, I thought I’d do a little DIY post about our kitchen. So, here’s to all you do-it-yourselfers! We moved into our apartment a couple years ago. It is a nice place with washer/dryer hookups, hardwood floors, and no drug dealers or prostitutes for neighbors (a real step up from our first apartment – but that’s another story). We loved our spacious kitchen. After a few weeks, we realized that we would be able to optimize the space in our kitchen if we got a stainless steel wall shelf and hung it above the refrigerator. Thankfully, I work for a restaurant equipment supplier and knew exactly where to get such a shelf. So, after some measurements, we decided on which size we wanted (14″ x 60″), we bought it, and we hung it up. Of course you can tell Jen had fun putting some decorative stuff up there. I was excited just have more shelf space, because for me shelf space = storage space. Jen was excited because to her shelf space = storage space + a place to display pretty things. I am really satisfied with this shelf. It is an economy-level shelf, so these shelves could have scratches incidental to the manufacturing process. But we put ours high enough that it looks really good. Here is another artsy shot Jen took. 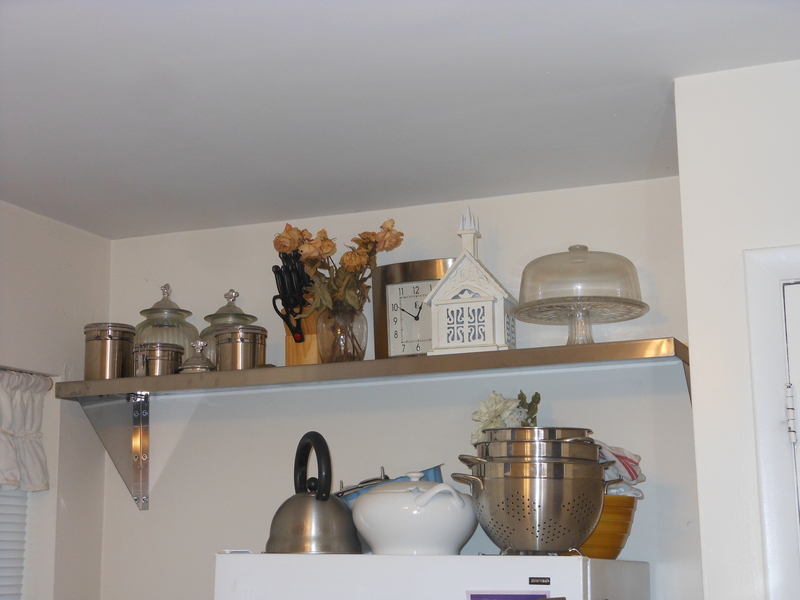 So, I heartily recommend Atlantic Metalworks stainless steel shelves to go over refrigerators in kitchens. If you want an immaculately beautiful wall shelf to be at eye-level, this might not be the best fit for you. But these shelves are superbly functional and inexpensive. Good luck in whatever DIY endeavors you are planning.